Last night we were relaxing at home when two new caches came out not too far from home, but far enough to have to think about dashing out for a FTF. We opted for the easy route and leave them for another time. Today, the children were due round at their Grandparents and with a slight diversion on the way, we could take in the two new caches. Both were still up for FTF as no logs had come in on them overnight. 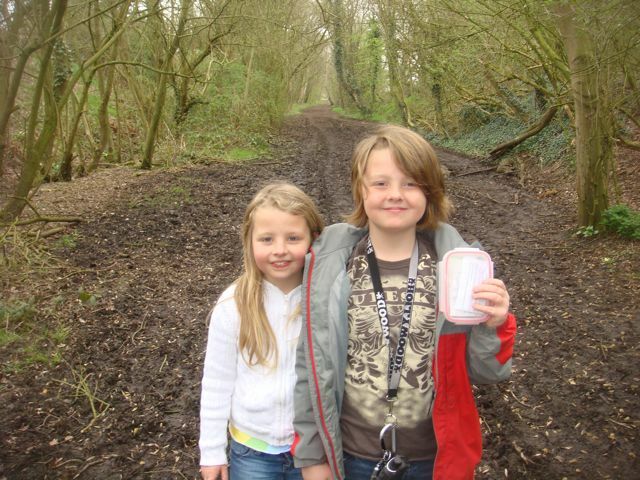 We parked up by the side of the main road for the first one and myself, Isaac and Freya set off for the short walk over the fields to the ex-railway line the caches are now on (it’s part of a walking path called the Way For The Millennium now). Freya spotted the hide right away and dashed over to check the logbook. Drat – we’d missed FTF by 15 minutes. Not a problem though as we had fun finding the cache and the location is nice. The second one was do-able as a drive-by and as time was short we opted for doing it that way. A short drive round and Freya again found the cache. Another one we’d just missed FTF on. Anyway, we enjoyed both of the caches and it’s especially heartening to see they are both by new hiders and they are both well thought out and not micros. We look forward to trying to find more hides by these people.